‘Thinking’ about learning a language is the same as doing nothing. Only ‘doing’ can do that. Learning something new could be fun but when it comes to language its bit tough, but if you follow certain techniques, soon you’ll be able to learn any language. Although there’s no magical way to go about it, with some hard work and practice you’ll be fluent in no time. Everyone learns differently, the thing with language learning, and truly with any objective or craving we have in life, is that we invest a great deal of energy pondering what we need, but way less time actually doing anything to get us towards that goal. Being a designer I’ve started pursuing a language in a different way. Yes, visual thinking is a learning style where the learner better understands and retains information when ideas, words and concepts are associated with images. Research tells us that the majority of beginners need to see information in order to learn it. Some common visual learning strategies include creating graphic organizers, diagramming, mind mapping, outlining and more. We all want to be in better shape. The issue isn’t that we don’t have the idea. Actually, it’s quite opposite! We know that we should do to exercise our creative muscles. This can be tricky, but it occurs completely in your mind and involves no action. And definitely language learning an endless process that will keep you busy. When you are in doubt, just start. Don’t worry about where to start and you will be doing more actual language learning than thinking or planning or researching can ever give you. Worse is that after you commit to learn you may feel frustrated with all the uncertainty and many of will quit. Being Consistent is the key here and no matter how much break you take, the goal is to complete what you just started. I actually agree that it’s too hard. During your pet project, you should use lots of techniques and lots of resources. Doing something out of your comfort zone makes you learn faster. The dream of a designer is to create meaningful designs that communicate on a visual, intellectual and emotional level. It is the joy of being creative. But the reality of that dream is that it often comes with the heavy price on the creative soul. There are long hours of efforts and often little recognition. These are the daily and universal struggles of a designer and this is my loving tribute to those who are reading this story. What Made Me Work On Learning A New Language? The most important thing is willingness. You should be willing to try things, even if they are outside of your comfort zone. So I opted a pet project that aims to be a space for creation around typography and its endless design possibilities. 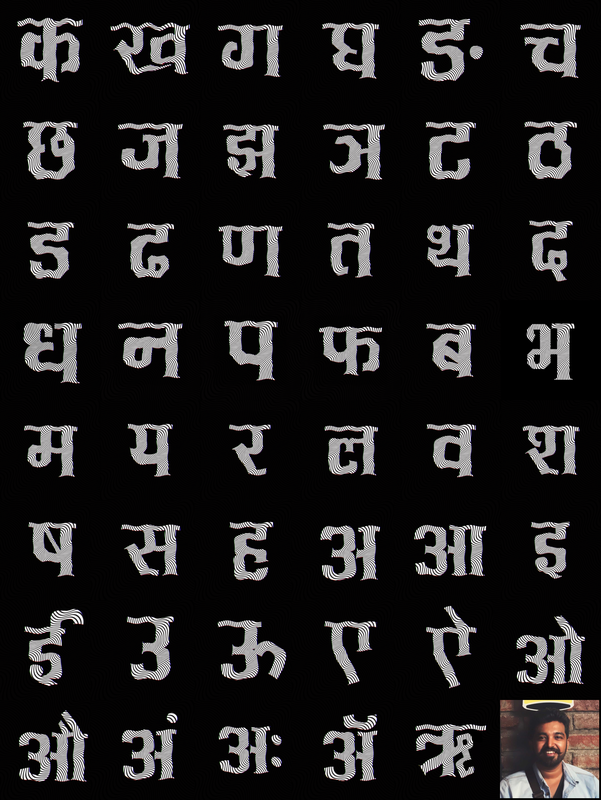 47 Days of Devanagari Type is a challenge to express a Devanagari script letterform each day from different creative perspectives. This project invites Designers, Illustrators and Graphic Artists to express their particular view on Devanagari alphabets. It is a wonderful opportunity where participants are challenged to design a letter or number each day, resulting an outcome of the ability to represent the same symbol from many different perspectives. If you have a friend or loved one who is willing to start something, sharing this would be a great gift! My Concept Behind Using ‘Distortion’. For anyone who looks at new script or letters is a form of distortion and until you understand we couldn’t read what’s in there, but art allows us to see the invisible layers of meaning that we experience in our everyday lives but are hidden or subliminal. In that way, art reveals to us important secret that most of The Beauty Lies In Distortion. If you enjoyed this story, then please hit the little 💚 green heart down there to help others find it. I invite your comments 💬 . Thank you for reading 🙏 . Aditya Dhotre is a self-taught designer who specialises in visual design, He is fuelled by curiosity and passion for design, technology and life. When he not busy breaking down design, he works on pet projects and short films. Adi always believed that the “Creative” arena will be his best playground. Made in Madras, Creator of @TheMadproject & @ConceptoHQ, Traveller, Heartist, Cinephile, Creative ninja, Coffee junkie, Old monk & Retro lover.